I’m actually going to split this into two posts, because there’s such a lot to cover in this step. It’s too much to read and digest in one go. So there will be another post tomorrow with some more on attaching the collar. Apologies in advance if you were hoping to get through it all today. Let’s get started on attaching the collar to the blouse. I’m going to demonstrate using the straight collar (View A), but the steps are exactly the same for the scalloped collar (View B) from now on. Open your blouse with the right side facing up so you can see the whole neckline. Place the collar face up (upper collar facing up – so the undercollar is against the right side of the blouse) on the neckline with the centre backs matching. You should have a notch at the centre back neckline, and at the centre back of the collar to help you line it up. Put a pin in where the notch is, through all layers, to hold it in place. Hello sewalongers! Are you excited to start sewing? Today we’re going to sew both of our curved shoulder seams using French seams, a technique for hiding the raw edges of the fabric. I’ll cover this with a high level of detail, but if you have any questions, please leave a comment below. A French seam hides the raw edges of the fabric and can be used on both straight and curved seams. Essentially, you sew the seam with the fabric wrong sides together at half the seam allowance, trim it, press it, then sew the seam with the fabric right sides together with half the seam allowance, so that the raw edges are enclosed within the seam. Step one is to pin your front shoulders to your back shoulders, with the fabric WRONG sides together. It’s really important, so double check that you have them wrong sides together (the opposite to how you’d normally sew a seam). The right sides of the fronts should be facing up. Today I’m going to write a little bit about preparation. I know it can be frustrating to be thinking about preparation when you just want to get stuck in, but believe me, it’s worth it! The number one thing to do with your fabric before you cut it is wash it. You should wash and press your fabric in the same way you’ll wash and press your finished blouse. It seems like a hassle, but take it from me, it’s worth it. You wouldn’t believe the amount of garments I have shrunk beyond wearable after their first outing! Fold your fabric in half to check whether it stretched in any places during the prewashing process – perhaps because of the way it hung during drying. Depending on what type of fabric it is, you may be able to straighten it a bit using the iron. The aim is to get the grainline as straight and consistent as possible all the way through the fabric. Once your fabric is prepared... you can get started on the cutting! Cut out your paper pattern pieces to the correct size, if you haven’t already. Make a note of which pattern pieces you need for the view you’re making – for this pattern, it’s quite simple as it’s only the collar pieces that differ between view A and view B. You also need to know how many of each piece to cut, and which pieces need to be cut on the fold of the fabric. For Bellini, the blouse back is cut on the fold, and two of the collar pieces need to be cut on the fold as well. Working on a clean, flat surface, spread out your fabric and get rid of any wrinkles. I’m using my kitchen table here as it’s very large, but the floor is also good, especially if it’s not carpeted. I’m using bits of old sheet for my Bellini, but your fabric will likely already be folded in half down the middle. If it isn’t, fold it in half, selvedge to selvedge. If, like me, you’re making a stripy Bellini, you’ll need to think about how you want the stripes to fall at this point. The stripes on my fabric are quite wide (6cm) and I want them vertically down my blouse. I want a stripe down the centre back, so I folded my fabric parallel to the stripes, down the exact centre of a stripe. Today we have a guest post from Alison over at Another Little Crafty Creation. Alison is going to show us how she graded up her Bellini blouse beyond the size range shown in the size chart. You can see Alison's beautiful Bellini blouse with lace collar (and Champagne skirt!) here. You'll need: Printed pattern, measurements, ruler/curves, pens/pencils, tissue paper. One of the most fun things about making the samples for this blouse was thinking about what kind of embellishment could be added to the collar. This is where you can really be creative and add whatever you like to your blouse. Beads, sequins, studs, gems... the choice is yours! If you’re sewing or even gluing on something, you have two options. 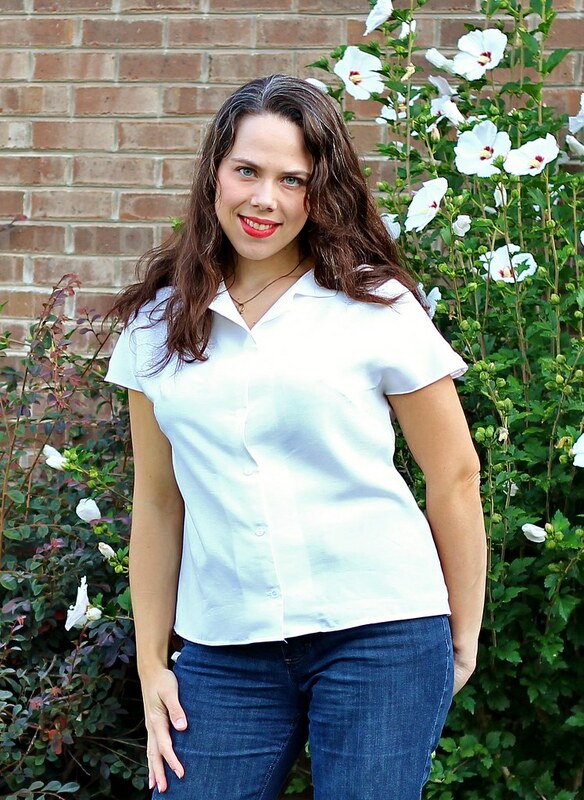 You can either embellish the collar before you sew it together, like Marie did with hers. This worked because the beads she sewed on weren’t very close to the edge of the collar, so she could sew the collar seams without sewing over the beads. On the plus side, the reverse of her beading is hidden by the undercollar, so it’s nice and neat. Marie has a great post on how to do it here. She also added topstitching in matching thread which I think makes the whole thing look professional. Today I’m going to go through a little bit of pre-amble about how to print and assemble your pattern. I’m sure most of you know how to do this by now, but I didn’t want to leave anything out. If you’re a PDF pro, take today off and come back tomorrow. Firstly, make sure you print the right file! You want Bellini Print at Home Pattern.pdf, unless you’re printing it on big paper in a copy shop, in which case, use the other one. It’s up to you whether you print the instructions; I like to make notes on mine as I’m working, but you could just as easily view them on a tablet or something to save trees.